As you've seen I'm somewhat obsessed with privacy and security plugins for Mozilla Firefox. Since writing my latest list of them, I've installed two more that I'm surprised I didn't discover before. 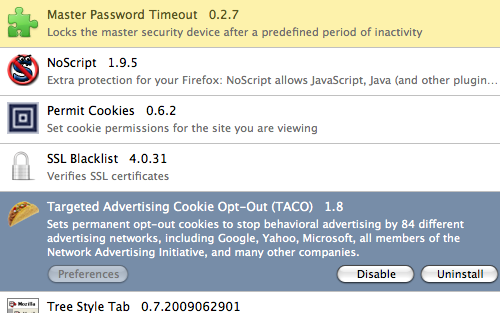 The first is Targeted Advertising Cookie Opt-Out with the cute acronym of TACO. According to the extension description, it sets permanent opt-out cookies to stop behavioural advertising by 84 different advertising networks including Google, Yahoo, Microsoft, all members of the Network Advertising Initiative, and many other companies. What I love about it is it installs cleanly into Firefox without any configuration required. The second is Master Password Timeout. If you're like me and use Firefox to remember your passwords for sites, it's critically important you assign a master password by going into Preferences > Security otherwise a malicious user accessing your machine could get your passwords in the clear. Master Password Timeout re-locks the master security device after a predefined period of inactivity which is useful if you tend to leave your browser open for long periods of time. Unfortunately it's not currently available for Firefox 3.5 but I'm hoping that will change, it works great in Firefox 3.0.11 on my FreeBSD box. All these extensions might seem like a symptom of paranoia, but personally given the Wild West nature of the Internet and how much of my life I spend on it, I couldn't think of using anything else at this point.